Desk, “to go, please.” – Write with us! Do you travel, need a nice writing surface and would love to have all of your accoutrements with you? Then look no further than Pineider, Italian makers of exquisite leather goods and fine stationery. 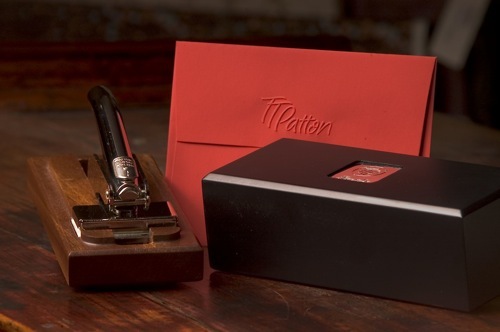 This elegant writing desk set, made in smooth calfskin with a cherry wood interior, contains 14 nibs, a dip pen, a black ink well, a leather notebook, Pineider water-cut cards, writing paper and envelopes. It’s the perfect blend of what Pineider does best, leather and paper. Every single item can be personalized, including the desk! To place and order, just call us and say “I’ll take the desk. To go, please.” But don’t get in a rush. Remember the leather is made in Italy and the stationery engraved there. So is it worth the wait? I’ll let you know when it arrives in a couple of weeks. Spoiler Alert: Pineider dates back to 1774 and doesn’t usually disappoint. Francesco Pineider opened his first shop in Florence in 1774, and for more than two hundred years Pineider has remained a point of reference for people who love style, beauty and the refined culture of writing. Pineider continues today with this tradition and still produces hand-made papers and hand-engraved stationery, luxury leather goods, writing instruments and wedding necessities of the highest quality. If you’re in Italy, say hello to my friends in Piazza della Signoria. But you don’t need to travel to Florence to get great stationery. Pineider is sold right here at TT Patton in downtown Barrington. ‘Love Pineider…great post. Hope you are having a wonderful summer thus far! You can earn some extra $$$ from your blog, i see couple opportunities here.